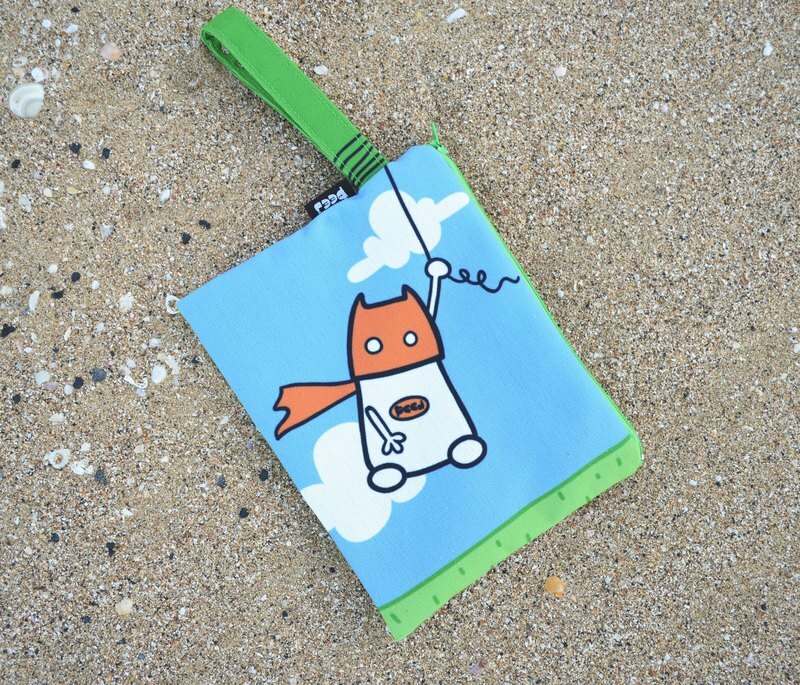 With a handy hand-strap that fits any hand, take out your Peej hand-held bags and brighten up your day! https://c2.staticflickr.com/6/5770/30961274710_0c2bdd10be_d.jpg Here comes Bat-guy. https://c2.staticflickr.com/6/5496/30507673334_62e97717d8_d.jpg Fly high with Super-guy. https://c2.staticflickr.com/6/5514/30507673084_b0d8c7520f_d.jpg Added layer inside for extra protection and a nice quality feel. https://c2.staticflickr.com/6/5640/31329962955_30db6d4309_d.jpg Comes with a little friend on the zipper. https://c2.staticflickr.com/6/5501/31214950441_2d98f3dc7a_d.jpg Enough space for everything you need for a day at the beach! https://c2.staticflickr.com/6/5802/30961273330_1a5b0b8f27_d.jpg Handy for everything needed at the airport. https://c2.staticflickr.com/6/5815/30507672274_173f4ffed5_d.jpg A perfect make-up bag. /Size/ 15 cm(Height) x 20cm(Width) Handle length from end to end 25 cm Width 2 cm /Material/ Canvas /Product Info/ These small bags are ideal for the essentials of the day. With a handy hand-strap that fits any hand, take out your Peej hand-held bags and brighten up your day! ▲Please allow for some variation in color as displayed on different devices and screens. Actual colors may vary.▼ /Brand Info/ “It’s the little things that make you happy” Our Peej family is made up of many characters, each with his own little story. The word ‘Peej’ literally means someone that can make you laugh. We hope that our little guys can do just this; to make you happy just by looking at them and to be the perfect accompaniment for your day to day lives. /Designer info/ Paul originally moved to Taiwan in 2000 and began his life here in education. After some time, he started designing teaching material for young learners and before long he realized that designing was the thing that he had come to love. And so came Peej: a natural progression which still revolved around the most important fundamental; making people smile. https://c2.staticflickr.com/6/5621/31255305256_ecb5e9d6cb_d.jpg https://c2.staticflickr.com/6/5560/30923536730_337b8e9b43_d.jpg When you order any of our characters or T-shirts, there will be a small gift in the form of badge or sticker added too. Made in Taiwan!